1051 Budapest, Erzsébet Square 13. We were in Budapest to research the career of Lajos Kassák (that essay is coming in November). Unbeknownst to us we arrived on the first day of Design Week Budapest. Despite our original mission there was no use ignoring the Design Week posters and flyers scattered throughout the city—our resistance crumbled and we were lured to the periphery of these activities. The same thing happened the following week in Vienna. It should be made clear that because we were in these cities for other reasons, we could only experience a small part of these events, and our report is just a slice of the full cake. 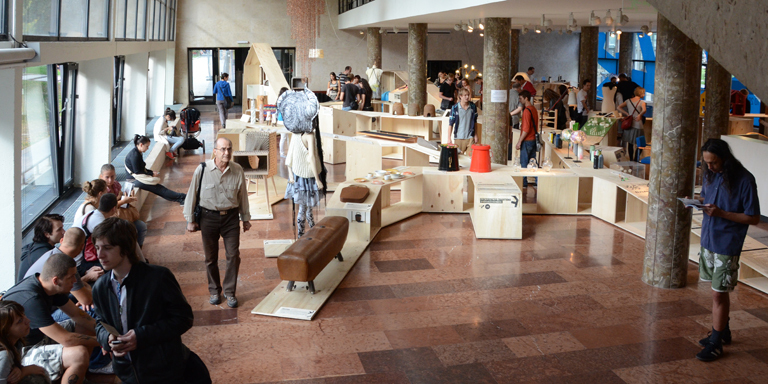 The 2012 Budapest Design Week was curated by Rita Mária Halasi, who themed the “Slow Design” event as a return to making things with care, less mass-produced, as well as considering the full-life cycle of a material product. From what we could see the focus was mostly industrial design with just a smattering of other design disciplines in minor roles. A repurposed bus terminal, now a Design Terminal, was the central location, hosting the main event exhibition and disseminating information about the over 100 programs happening over the next ten days throughout the city. 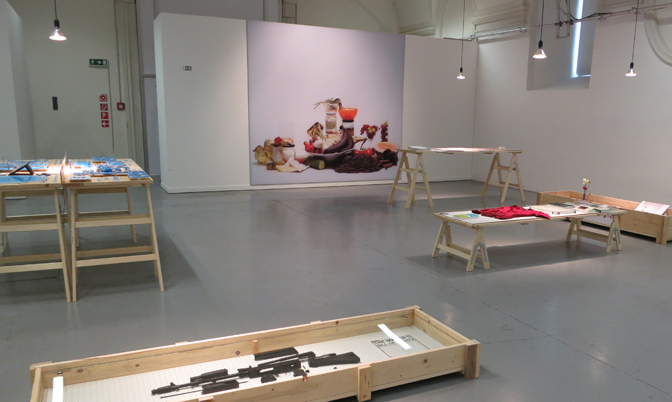 On the Terminal’s ground floor was an exhibition of about 80 selected products from 12 countries. The items were divided up into categories dealing with environmentally responsible themes, ie; recycling, reusing, low impact, design it yourself, eEco-design, (G)localism, inclusive design, low tech, downcycling/upcycling, plus a whole category dedicated to urban bicycle culture. The designs ranged from the really useful to the somewhat questionable. 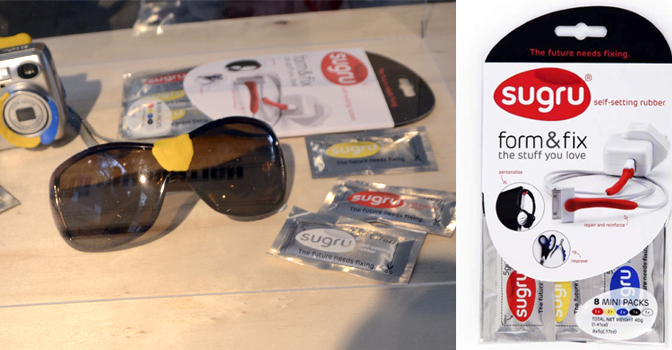 Irish designer, Jane ní Dhulchaointigh, is responsible for Sugru, a colorful silicon epoxy that could repair and extend the life of just about anything. It was a clear conceptual and commercial winner of the exhibit. Zita Majoros, a Yugoslavian-Hungarian graphic designer showed recycled clothing that was converted into fashionable duds adorned with attractive silk-screen prints. 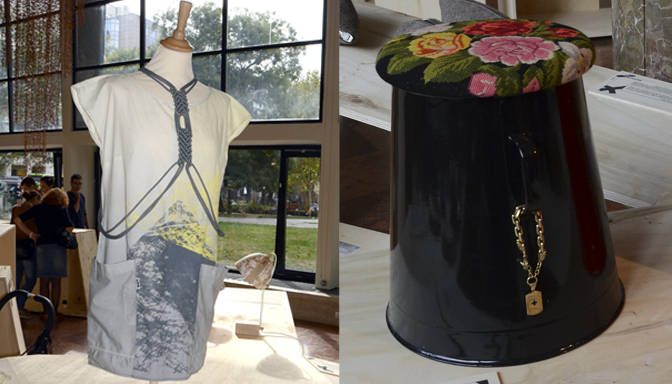 PRINTA, recycled and silkscreen printed clothing / BÖDÖN: A stool that is a reinterpretation of a traditional Hungarian bucket. There were some items that were slightly implausible, such as a Walking-Chair Studios’s lampshade, named Sister Blister, made of used pharmaceutical blister packs. (It was pretty unattractive and decidedly un-dustable!) Our personal favorite entry was a ‘tree stump’ seat submitted by Ubico Studio, Israel…it made us laugh out loud with the irony of wood pieces reassembled into a stump stool similar to what you would find naturally in the forest.You can see the entire exhibition catalog at this on line link. On the second floor we found an exhibition by the invited guest artists of Fiskars Village, a small community situated about 100 km south-west of Helsinki, Finland. The self-sustainable artist colony of 120 artists and designers was established after the famous scissor manufacturer moved away and left numerous unused buildings in its wake. The work was seriously sleek and organic in form. There was also a Fiskar’s Pop-up Café that featured Finnish food, with one item peculiarly named, Smoked Roach Mousse with Potato Crêpes. We saved our appetites for stuffed cabbages and homemade beer at the Great Hall Market. Farther afield we dropped into a few locations that were participating in Design Week. The shop, Rododendron, had a seriously tempting selection of jewelry and design chachkas. The shop that most paralleled the spirit of Design Week was PRINTA, a silkscreen studio that recycled clothing into new fashions they decorated with trendy silkscreen printing. 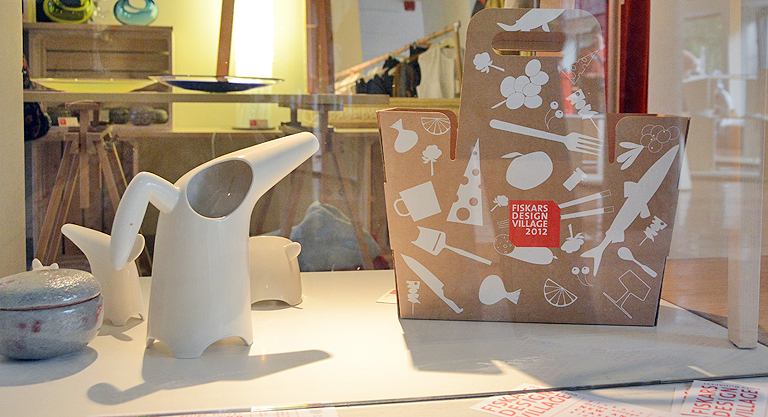 we saw in the Design Week exhibit. Unfortunately this was the extent of our participation but Budapest Design Week’s press release claims a yearly attendance of over 60,000 so it is highly probable there is more complete coverage on other blogs out there. It was evident that the organizers of Vienna Design Week had a lot more money and resources to expend on staging and advertising their event, so much so that we felt crushed under the amount of information to wade through in brochures, posters, web site. The dizzying number of events made it difficult to narrow down to just a few during our four days in town—especially with the competition of the citywide 150 Years of Gustav Klimt extravaganza in full swing at almost every important museum venue. After initial befuddlement we were informed that, unlike in Budapest, there was no central Vienna Design Week location inside of Vienna proper (but rather at a location outside of the city). Later we read that the event structure was a social network revolving around design which made more sense. However the glass walled, Kunsthalle near the Kaiserplatz functioned as an information point with tons of brochures and helpful Austrian art students who spoke perfect English. The lectures that were scheduled at that downtown location were mostly in German so, being pathetically monolingual, our dilemma as to whether to attend or not was solved. Each of the eight designers included a sampling from their portfolio alongside the work they produced in collaboration with a commercial manufacturer. Some of the collaborative pieces were interesting but many teetered on the edge (or fell way over the edge) of what could be considered graphic design. For example the workspace, SundayMorning, presented something that look liked brick-sized blocks of clay slumped onto found objects including an old record player turntable and a ceramic latrine. For us this was the most confounding piece in an exhibit that had more than it’s share of loose connections to graphic design. 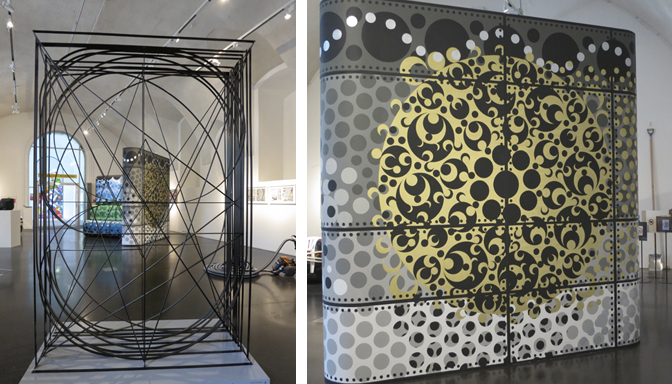 Some of the more successful collaborations were by Dutch designer Koen Taselaar who worked with metal fabricator Metaalplan to create a large alphabet sculpture and London-based Tod Hanson’s exciting oversized patterns printed on cloth by Vlisco, a company that designs and produces fashion fabric in West and Central Africa. Joachim Schmid of Berlin exhibited four of his framed works made from thin strips of shredded magazines. 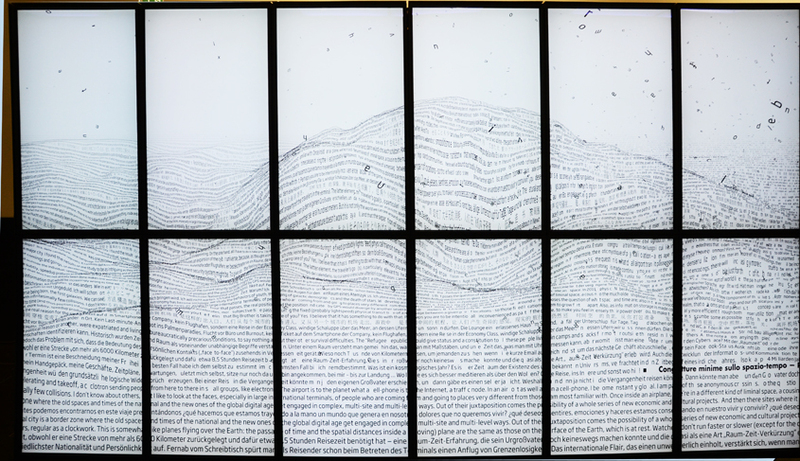 The overall effect was visually rich in detail and made one search for meaning in the shredded words and images. His collaborative entry, a book printed with NPN Printers, was based around Marshall McLuhan and his love-hate relationship with technology. Schmid’s personal and collaborative works were among the most fully developed of the group. 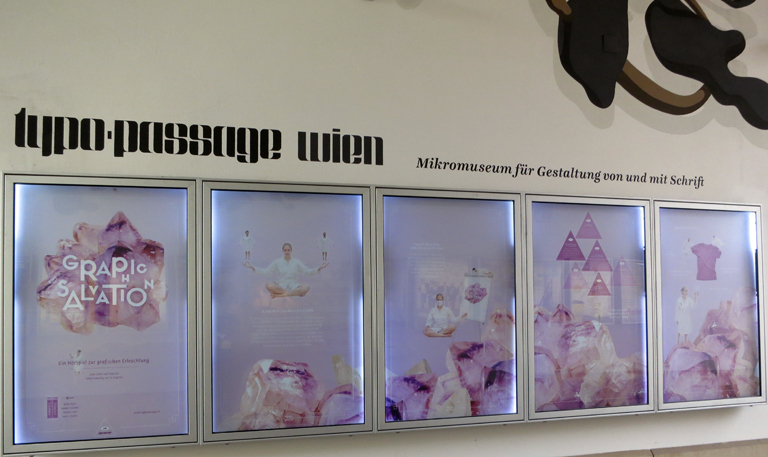 Erwin K. Bauer is the curator of a tiny typographic exhibition in the form of a thematic passageway that enters the Museum Quarter. The outdoor space is used present changing contemporary typographic installations. Overhead a permanent work by Alex Trochut from Barcelona, referenced Frederic Garcia Lorcas’s Pequeno Bals Vienes (1930) and Leonhard Cohen’s song adaptation Take this Waltz (1988). The Vienna related story is translated into a camouflage pattern of spots but at a distance one can discern letters. The temporary installation was by the Junior Research Fellows, “mind-expanding research group at Vienna’s University of Applied Arts, dedicated to the inner and outer cognition of graphic design… propagating their vision of a “Graphic Design Future Harmony,” aiming to improve the holistic perception of graphic design and its relation to humans…these sensitive mediators dissolve communicative blockades and offer a step-by step road map to an illuminated identity within a design world. The exhibition is accompanied by a publication available 24/7 in nearby vending machine. We missed their talk and procession to the space but did catch their music clip on sound cloud. Be sure to turn up your speakers for this. A nearby second show, sponsored by the MAK, was a laboratory for environmental design considerations. Mostly it seemed to aim at educating the viewer about the environmental cost of modern life; how much water and resources are required to make a chair, why some products advertised as green are not really green and how much food waste a few neighbors make in a week. 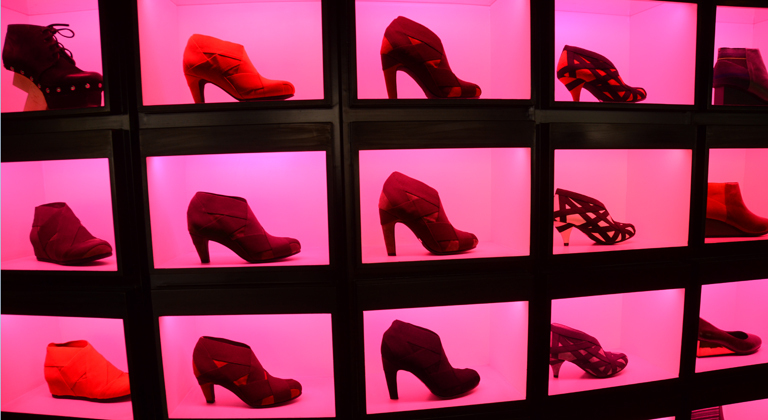 The products are displayed inside of wooden shipping crates, very humble, almost amateurish in appearance. To be fair there are videos on-line that show the students designers working hard on how to solve these problems—not so evident to the viewer in the show. What seemed at odds with the show’s theme was a large format catalog given to me along with a ticket (that no one collected). When I returned both items to the desk as I exited, the ticket seller seemed taken aback that I didn’t want to keep the catalog. I told her to recycle them but she was clearly nonplussed at my action. There was also bit of irony after leaving the show that was located next to a series of shops selling gimicky design trinkets, book stores and kiosks exploding with endless printed brochures (each with a usage life of about an hour). The show did take me back to my student years at Cranbrook in the late 1970’s where we considered the same issues and read books by environmentalists such as Victor Papanek. (His book was on display in the Design Revolution exhibit). Sorry to be pessimistic but we’ve observed is that most people will not make fundamental changes unless intensely pressured by circumstances that demand action. Design Revolution is rarely embraced by the comfortable. Our realization was reinforced later in the day when we ran across an outdoor exhibit by Doctors Without Borders / Medecins sans frontieres (not part of Design Week) displaying survival techniques in refuge camps. Space efficient homes furnished with discarded furniture; implements made from available natural materials, ingenious water collecting and purifying devices provided life saving water—all eco-conscious out of necessity not altruism. At the core of this work is an imaginary space, one at the interface of all the world’s airports. Passengers enter it when they pass through a security checkpoint prior to takeoff, and leave it after touching down at their final destination. This space’s boundaries are constantly shifting in accordance with current air traffic. Within its confines, cultures, languages and nations segue into one another like adjacent time zones. It creates real-time interpretations of arriving and departing flights. “ZeitRaum” consists of a series of stations that accompany departing passengers on their way to their gates. The airport authority will also be using the installation for half of the available time as an ad medium. We took some pictures but you can see great videos of the work…it will amaze you even if you are not at the location. It was an inspiring ending to an already inspirational trip.